Yesterday was a nice sunny day. My daughter and Andrew brought lunch over. After we ate we went out on the patio for a bit. He found a marble out there in one of my plant pots. I told him I had a bunch of marbles in vintage mason jars if he wanted them. Of course he’s never heard of playing marbles in this current day and age. But we watched a YouTube video and he kind of has the concept down. You can’t see the marbles because I wasn’t far enough away from him and I had my zoom lens on my camera. He seemed pretty excited about them. I imagine he will talk his dad into playing marbles with him. He was so excited he didn’t take time to wipe his lunch off his mouth. But that’s little boys, isn’t it? Full of fun and too busy to deal with such things. I played alone with my marbles most of the time when I was a kid. But Andrew can introduce the old fashioned game of marbles to his friends. Andrew has sure grown a lot. He’s getting so tall. And he’s five years old now. We had a good time together. Here’s what’s going on out on the patio in the container gardens. 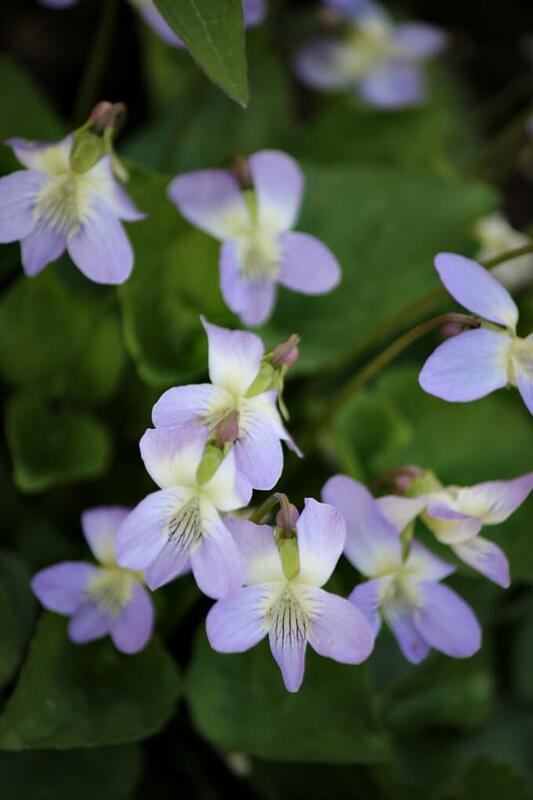 The wild violets came up in the pot that holds the clematis vine. I think they’re cute little flowers. Look how much Jade has grown since last week. Her leaves have shaped out into their butterfly shape now. I so love this little tree! This is the second summer for Jade on my patio. 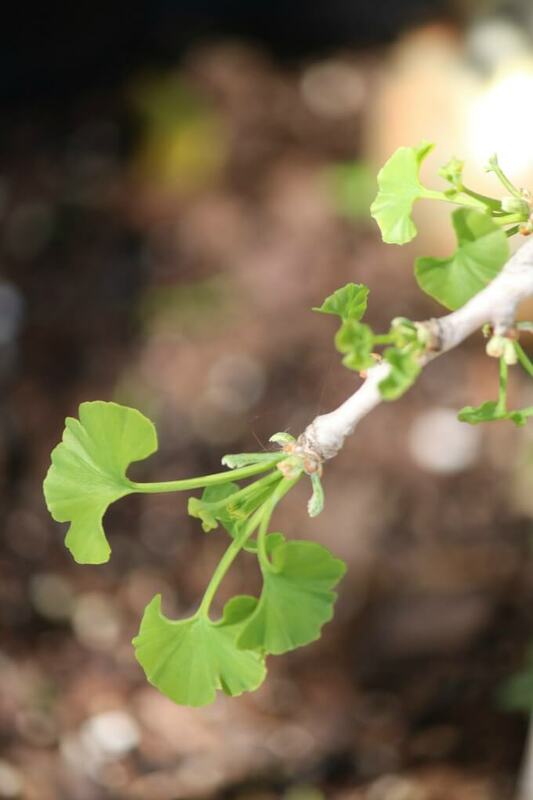 In case you’ve forgotten, she is a Ginkgo biloba jade butterfly tree. From my recliner, this is my view outdoors. 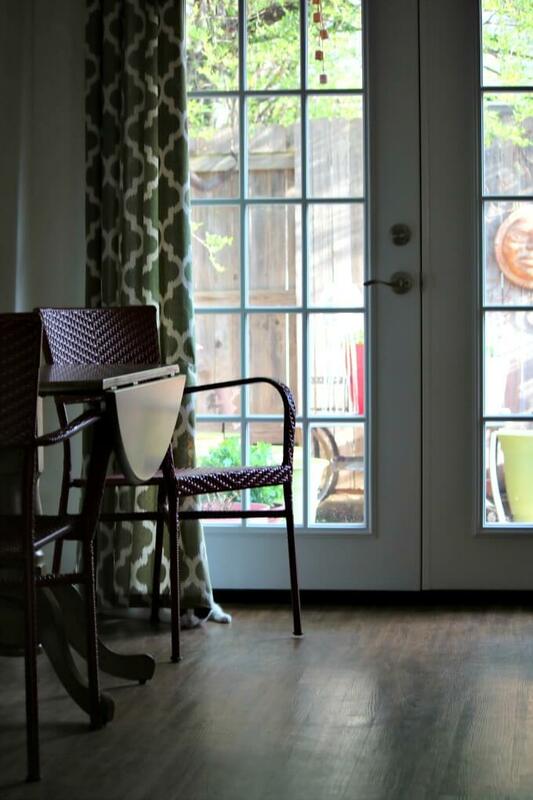 I so enjoy sitting and staring out the French doors that are new this year. Do you see a certain little someone in the above photo? 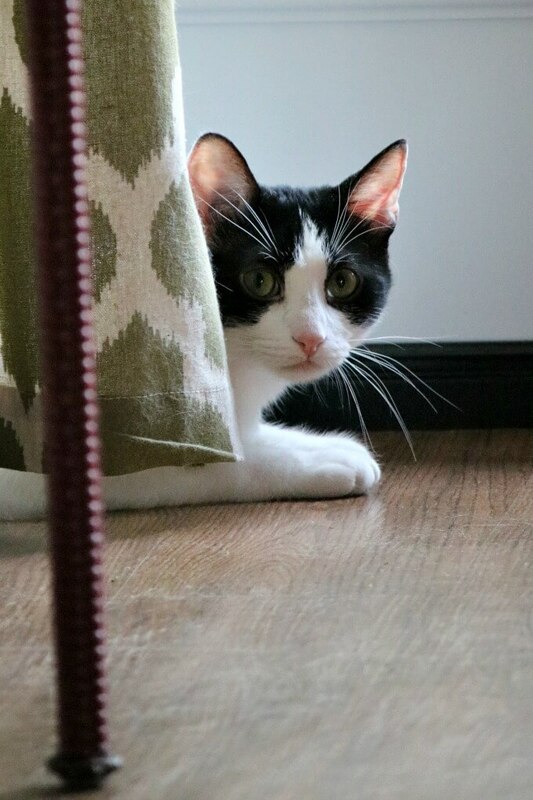 Yes, Miss Ivy loves to play under the curtains. And yes, there’s now lots of cat hair on those curtains. Such is life with a kitty in the house. Her eyes match the green in the curtains. Ivy has such pretty eyes. I didn’t manage to get a photo of Charlie boy today. Maybe next time. The weather is gorgeous, everything is greening up, and spring is finally here. Ivy is such a beautiful cat and Charlie is just the sweetest dog. It is a lovely view to outside through your French doors. Enjoy!. Oh and I believe Andrew grows a little taller with each picture you post. Such a cutie. How cool you have introduced the marble game. I remember marbles and the “cat eyes”..u can remember girls and boys playing at recess. The garden looks beautiful. .glad I’ve also has more play light from the great door. Happy Spring! Your grandson is a cutie. I have two and they are loads of fun..!!! 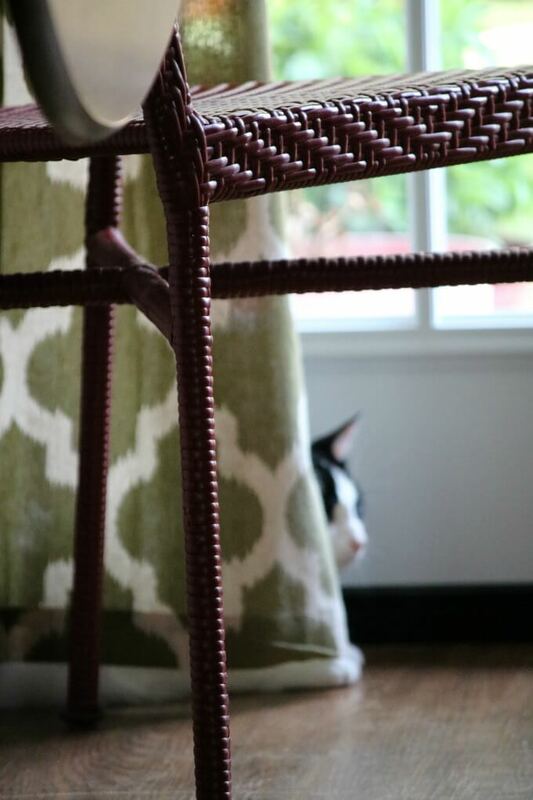 Miss Ivy looks cute hiding behind those curtains. Love the wild violets. So pretty. Enjoy your day. I love your French doors. I have them in my entry way and they need to be redone. But just love them. Your garden is really popping. My curtains have dirt at the bottom from my Norah hiding behind them and playing. I really like your green curtains. If you remember where you got them could you shoot me an email? Andrew is a darling, so cute and getting so big! Miss Ivy looks like a scamp looking out from the curtains. How fun you had your daughter and Andrew over. I bet he will love playing with the marbles you gave him. So fun to see kids liking old fashion games off the electronics. Have a great new week ahead. Andrew is so sweet. I love the idea that you have introduced him to marbles. I have a huge jar of them myself, and looking at them takes me right back to the playground with my friends. Love seeing Ivy, I can only imagine how she keeps you on your toes. I thought my grand daughter pickup sticks and jacks. She was the hit of her girl friends bc she got to teach them the new games. How nice to have lunch with your daughter/grandson. I know you all enjoyed the time spent together. Andrew is such a good looking young boy and I’ll bet he will really enjoy those marbles. Your patio will be full of greenery and lots of blooms soon; cannot wait to see the new plants you choose for this year. Love the pics of Ivy. Andrew is such a handsome boy – he looks a lot like you, Brenda! Wow,things are really happening on your patio now! I’m excited to see some green popping out in my gardens, too – when I clear away leaves there are shoots and greenery underneath, it’s so exciting! Andrew is growing so fast! I am glad that the two of you have been able to spend precious time together. I really like your new patio doors. What a difference they make and your view through them is to be envied. My friend surprised me with a solar birdbath fountain. Andrew is adorable and such a handsome young man. Five years old is such a great age for a child. I think we “adults” sometimes forget that at that age, the world is a child’s oyster and they are much more sophisticated in their thinking and “vision” than we imagine them to be. I have spent many a pleasant hour talking with nieces and nephews when they were that age and a little older, and now, with their children! 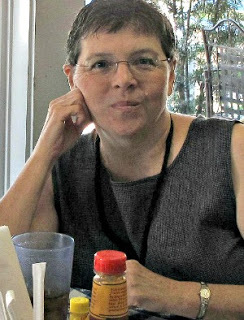 Of course, at 67 I appear extremely ancient to them, LOL! But I don’t feel a day older than them, truth be told. It reminds me of endless hours I spend with my paternal grandparents just talking to them about – everything under the sun when I was about your grandson’s age. Those are such priceless memories to me now, more than 60 years later. 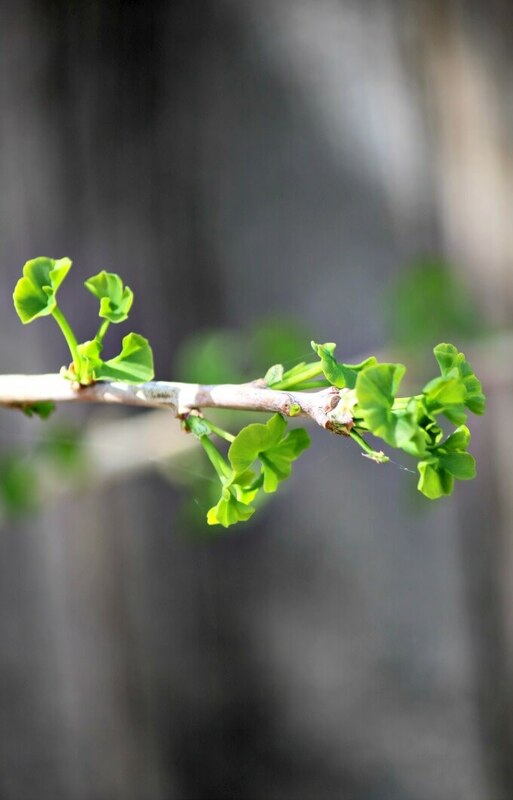 Your ginko tree is gorgeous – there’s no mistaking the definitive shape of a ginkos leaves. Beautiful. Today we topped 70 degrees where I live in SE WI. In a few days we may be back to the “wintry mix” and strong winds weather. We had a lot of rain last night, so it was too wet to do any serious yard work or continue to clean out the garden beds here today. Tomorrow will be much cooler and better for working outdoors. Today, I hung up the decorations on my fence that I enjoy so much and sat out reading for HOURS while tossing nuts to the occasional squirrel who wandered by. It was wonderful. Brenda, I am trying to grow herbs this year. Could you tell me how to care for rosemary and sage. Best thing is to have good drainage and don’t over water. Brenda, your plants are looking so pretty! I’ve been noticing some green on my hydrangeas. I wish I knew what to do to get them to bloom. I had a couple of blooms last year and have tried different things, but they won’t get past 2 or 3 blooms on each bush! 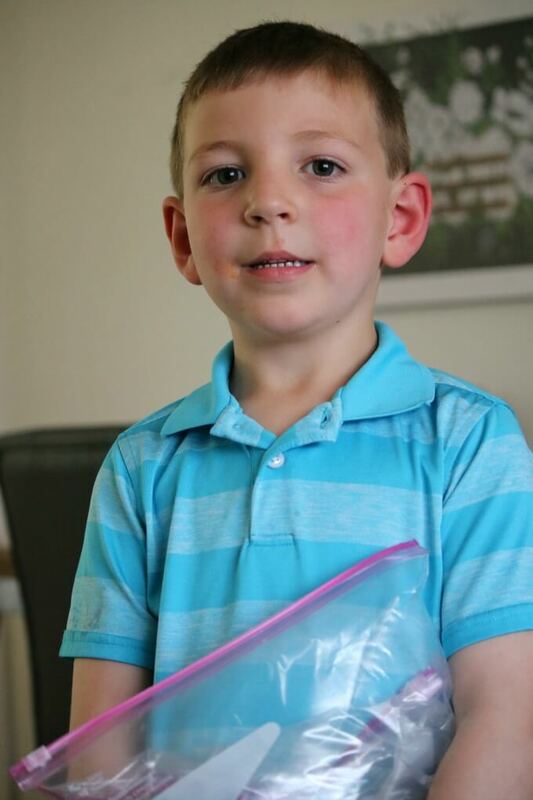 Andrew is adorable and I think it is great he is learning about marbles. We use to love to play Jacks…which kids today know nothing about! 🙂 Love and hugs! I see the resemblance that Andrew has to you as one of your readers already cited. You’re both very cute. I know he’ll be the hit of the week with his buddies teaching them how to play marbles. I taught my granddaughter songs to sing with jump rope and her girlfriends were quite impressed with her. I love Miss Jade and may have to indulge and get a tree like this. Hope good growing weather continues in your area. We had storms today but my hostess in pots welcomed the rain and saved me from tugging on the hose to water. Hopefully spring is now here to stay. What a delightful and fun day you had, Brenda! I’m sure teaching Andrew about playing with marbles put a smile on your face.